The black bear is the most common bear in North America, as National Geographic reports. Due to their numbers and wide territory range, human-black bear encounters are relatively common. Those living in woody suburbs might occasionally see a bear searching for easy food in town or even cooling off in an unoccupied backyard pool. Luckily, black bears rarely attack humans, and are much less aggressive or territorial than brown or grizzly bears. They are mostly opportunistic eaters and would rather avoid a confrontation if they can. Often, loud threatening noises are enough to deter a black bear from coming any closer. 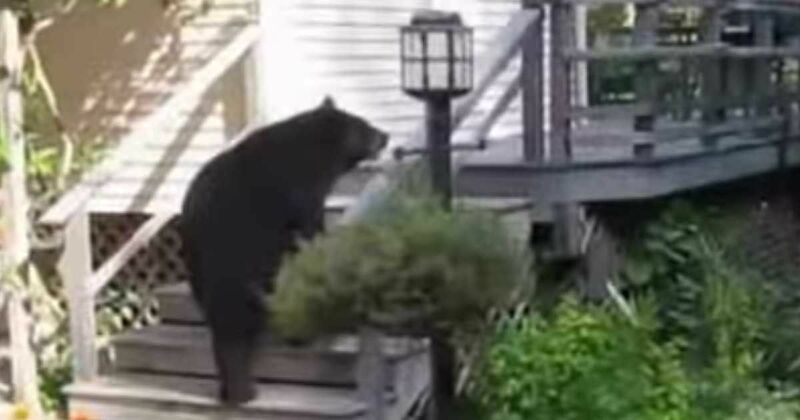 In this home video, it seems this family has been visited by this bear before. When Mr. Grillo sees that the bear is back to explore his backyard, he calls in an enforcer. Her fearless stance and commanding voice certainly taught this bear that this is not a house to be messed with. Still, that is not to say that there are not inherent dangers in a black bear encounter. They are still very powerful animals and can easily cause serious injury or property damage. As New Jersey's Division of Fish & Wildlife explains, the best way to avoid attracting a bear while camping or if living on the edges of their habitat is by properly storing and disposing of foods. Even something as innocuous as an outdoor bird feeder can be enough to make a wandering bear linger and return for an easy source of food. As National Geographic keeps on explaining, "black bears are very opportunistic eaters, (...) Bears who become habituated to human food at campsites, cabins, or rural homes can become dangerous and are often killed—thus the frequent reminder: Please don't feed the bears!" What did you think of this video? Do you have a similar bear encounter to share with the rest of our fans? We love hearing your stories.